"Oil won the skirmish," says Gov. 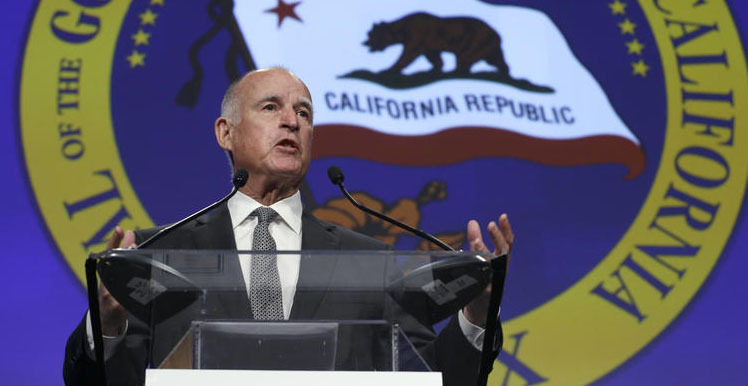 Jerry Brown, "but they've lost the bigger battle." After decades of denial, BP, Chevron, ConocoPhillips, ExxonMobil and Shell are now talking the talk. The five oil giants -- collectively responsible for 12.5 percent of all industrial carbon pollution since the 1850s -- now publicly concede that climate change is real. They acknowledge that it is primarily caused by burning their products. Some of them even support a carbon tax. That said, the five carbon majors and the rest of the oil and gas industry are still spending millions to deceive the public and derail government attempts to address the problem. What happened in California this summer is a case in point. The state Legislature was considering a climate bill designed to double the energy efficiency of existing buildings, increase electric utilities' renewable energy use to 50 percent by 2030, and halve petroleum consumption by cars and trucks by 2030. The oil industry objected to that third provision, misleadingly dubbing the bill the "California Gas Restriction Act of 2015." And, according to state data released this week, the industry tripled its quarterly lobbying expenditures -- from $3.68 million in the spring to $11.5 million from July through September -- to pressure California lawmakers to scrap the oil reduction goal. More than half of the industry's summer spending spree came via the Western States Petroleum Association (WSPA), the industry's main lobby group on the West Coast. WSPA doled out $6.7 million, more than twice what it spent in the first six months of this year. On top of that, BP, Chevron, ConocoPhillips, ExxonMobil and Shell -- all WSPA members -- together kicked in $2.45 million, more than twice the $1.06 million they spent in the spring quarter. Of the five, Chevron -- California's largest oil company -- was the big spender, dropping $1.8 million during the three months covered by the reporting period. Some of the money went to wine and dine key lawmakers. But most of it underwrote a PR campaign to scare California drivers, falsely claiming in direct mail pieces, on billboards, and in radio and television ads that the proposed bill would lead to gas rationing, driving restrictions, minivan fines, and SUV bans. Even the organization taking credit for the campaign -- the California Drivers Alliance -- is phony, one of more than a dozen fake grassroots groups WSPA has created to promote its agenda. The disinformation campaign paid off. In early September, the Legislature dropped the oil consumption provision from the bill that Gov. Jerry Brown signed into law last month. Senate President Pro Tem Kevin De León, the bill's author, vowed to continue the fight. "Big Oil might be on the right side of their shareholder reports, but we're on the right side of history, he said. "And ultimately California is going to demand that an industry which represents most of the problem has an economic and moral duty to be part of the solution." California's goal of cutting oil consumption in half is certainly achievable. The Union of Concerned Scientists provided a blueprint in 2012 for the entire country to meet that target over the next two decades. Identifying a number of ways to wring oil out of the economy -- from retrofitting buildings to producing better biofuels to making planes, trains and ships more fuel efficient -- the organization calculated that the United States can feasibly slash annual demand by more than 4 billion barrels by 2035. Whether such a plan at the federal level ever materializes will depend on political will, which in turn hinges on whether the oil and gas industry's grip on Congress can be loosened. If forward-thinking legislators on Capitol Hill can't put an end to the $4.85 billion in today's dollars in subsidies and tax breaks the oil and gas industry has been averaging every year since 1918, will Congress ever endorse a half-the-oil program? For his part, Brown told reporters in September that he would use his executive powers to outmaneuver the oil industry. "Oil has won the skirmish, but they've lost the bigger battle," he said. "Because I am more determined than ever to make our regulatory regime work for the people of California: cleaning up the air, reducing the petroleum and creating the green jobs that are going to put hundreds of thousands of people to work over the coming decades." In the meantime, the progress oil companies have made in their rhetoric has to be matched by their deeds. They need to start walking the walk.